Angela Akins Garcia’s love for sports is overwhelming, especially considering the myth: women are not a lover of sports. Maybe, her birth into a sporty home practically influenced her choice as a sportsperson or she is just naturally interested in sports. However, she has been quite successful as a sportsperson and has gone ahead to do an exceptional job as a sports journalist for Fox. However, she is better known as the wife of the famous golfer Sergio Garcia. Angela Akins Garcia was basically in some form of obscurity until her marriage to the sports star thrust her into the spotlight, thus info is scarce on the events of her life before the period she married the pro golfer. Though it has been established that she was born in 1985, the exact month and day she was born are still unknown to the media. Angela Akins Gracia developed a passion for sports as a kid and decided to play golf. Then, she took several lessons on how to play golf, mastering the skills behind making a strong yet calm swing. As the years passed by, she became experienced and bagged over 8 tournaments as a high school student. During her days as the captain of Mable Falls high school golf team, Garcia led her team to the 3rd place in the 2003 regional competition and they subsequently came as sixth place in 2006. It is no doubt that the lady is quite skilled at the game and has claimed over 17 medals to her name on the national level and is a member of Women’s Texas Golf Association. Upon graduation from high school, Garcia proceeded to Texas Christain University, studied there for a few years before transferring to the University of Texas. Her arrival to the University exposed her to a more competitive platform, thereby making her skills stronger as the days rolled by. Despite the fact that the lady found joy and fulfilment as a golfer, Angela Akin Garcia never dreamt of pursuing golf professionally instead she chose journalism. So, after graduating from the university, she landed a job as a reporter on Fox Sports Southwest. As a reporter, she has impacted most sports program on Fox. She co-hosted Fox Football Friday, Access Golf and Southland Conference. She has also served as a sideline reporter. Angela Akin Garcia is quite drawn to sports as she was born into a sporty home. Her father, Matty Akins in his heydays was notable for his skills as an American footballer. He played football for one of the clubs in Texas. He showed his athletic prowess through 1972 till 1975 when he quit the game. Also, he much interested in politics and once ran to be the Democratic nominee for Texas Comptroller in 2002, unfortunately, he lost. Martin was excellent in the game of football and holds a spot on the Texas High School Football Hall of Fame and University of Texas Hall of Honor. He is a sixth generation Texan. More so, Akin’s granddad, Ray Akins was a football coach in Texas high school. Ray served as a coach for over 36 years and was on 293 games and made 17 playoff appearances at Gregory-Portland High School. Angela Akins Garcia is also cousin with New Orleans Saints quarterback Drew Brees. 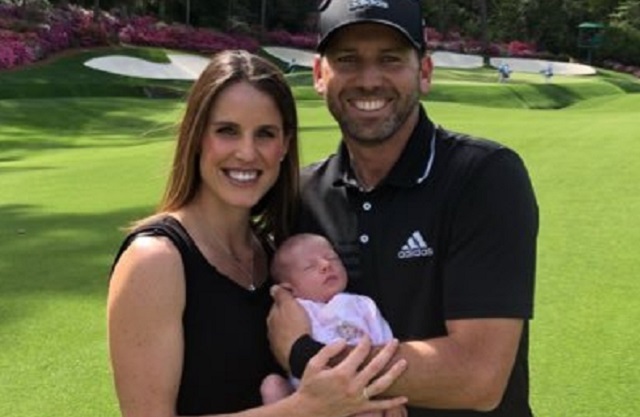 Angela Akins Gracia is married to Sergio Garcia Fernandez who is a professional golfer playing for the European and PGA Tours. Through his years as a golfer, he claimed over 30 international tournaments. He was the 2008 Players Champion as well as the 2017 Masters Tournament. He is regarded as one of the golfers who has the highest golf rankings. Aside from being a golfer, he is also the Chairman of the Spanish soccer team CF Borriol. Akin and Sergio met sometime after the lady’s divorce with her first husband, Ross Hammann was finalized. They kicked off a relationship and subsequently got engaged in 2017. Together, they share a daughter named after the famed flowers of the Augusta National Club, Azalea. In an interview, the lady publicly stated that in as much as she takes delight in the game of golf, she also is a die-hard fan of the game of football. In fact, in her words, she publicly stated that she takes more interest in the game of football than in golf, this is a passion she shares with her golfer husband.